Writing and sharing personalized letters on mobile devices has just become better with a leapfrog design where the message becomes memorable media. Thanks to a redesign of the increasingly popular lettrs® social messaging and media platform, Version 2.0 now offers consumers, brands and nonprofit organizations branded messaging and mobile fan mail at scale. "A year after introducing the first version of lettrs, we have completely revamped the user interface and added features that respond to consumer usage and requests," said Drew Bartkiewicz, lettrs CEO and co-founder. "Designed like a Rubik's Cube, our new version provides a multidimensional discovery experience that makes it easier for users to find letter-writing elements they like and invites people to meet other people as pen pals in the network." These hand signed mobile letters are shareable across every major social network, native SMS, and even old-fashioned email. The app is becoming the universal writing desk for the mobile world and has notched more than 2 million downloads and over 3 billion network impressions in 12 months, with users spanning 170 countries and translated letters in 80 languages. The updated lettrs app addresses trends confirmed in a recent Pew Research Center study, which found growing U.S. use of smartphone messaging apps, as well as increasing popularity of image and video sharing. According to the research, more than one-third (36 percent) of all adult smartphone owners and nearly half (49 percent) of smartphone owners age 18 to 29 use messaging apps. Respondents said texting couldn't convey emotions and this is exactly the unique expression network that lettrs has built, growing in stark contrast to the market of disposable messages and chats. You can download the lettrs Android app from Google Play and iOS app from iTunes. 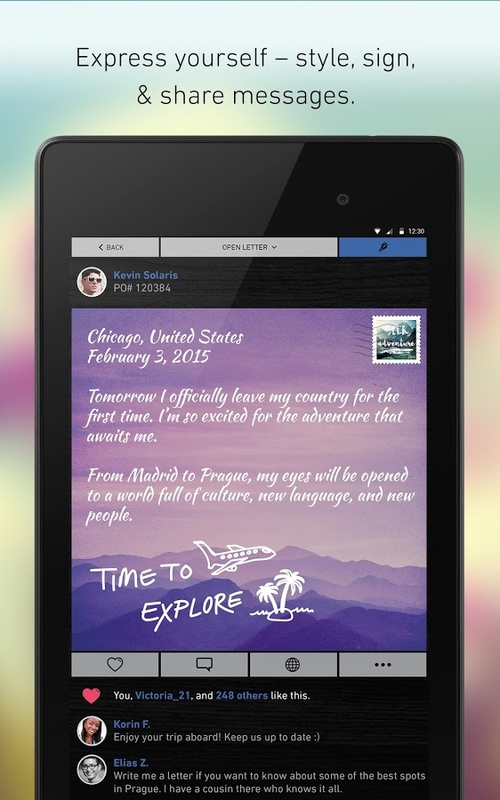 lettrs is a powerful social messaging and media platform that allows more personalized expression using letter-writing elements, such as calligraphy, stationery, stamps and signatures. The network carries digital fan mail that fuses people, pictures, prose and personality. lettrs was selected as a Google Play Best Android App of 2014. 0 comments on "lettrs Expands Its Social Messaging App To Enrich Discovery and Delivery of Personalized Messages"